Recently I took a jaunt down Washington Boulevard to explore some of the many galleries in Culver City’s Arts District. Due to my slightly poor timing, many of said galleries were closed. Luckily, though, I visited Hinge Modern, at 8558 Washington Boulevard, just in time to see a quiet yet enjoyable show. “Simone Alexandrino and Daksh Sahni: Out and In of Symmetry” displays the works of a team of fiancés. Though they’ve each been making art for years, this exhibit marks their first artistic collaboration, an effort of six months. 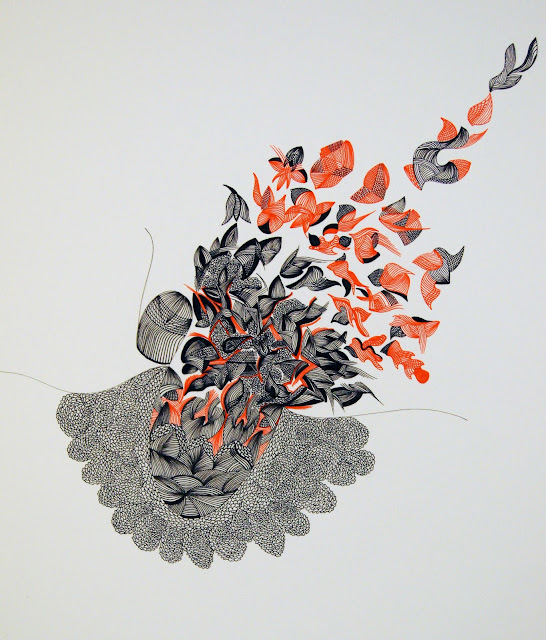 Ms. Alexandrino creates delicate, organic, abstract ink drawings, while Mr. Sahni has taken her works, digitized their forms, and used computer imaging and 3-D technology to distort and transform her designs into an entirely different visual experience. The works are placed on opposite walls, creating a sense of dialogue and visual continuity. It’s incredible how simple distortion and repetition of form can turn one image into a completely different visual experience. She with the ink pen, and he with the computer: their works, juxtaposed against one another, create a beautiful synthesis. Ms. Alexandrino’s ink drawings are abstract, curvilinear forms with smaller detailed lines inside larger sweeping outlines. They are a simple delight for the eyes. From far away her works look like paisley, but up close her forms, rendered in one to three tones on plain white-cream paper, are almost sentient, reminiscent of birds’ wings, flowers, or butterflies. One work, with its tightly drawn bundle of leafy forms, resembles a tense, vibrating chrysalis—about to burst forth into one of the other lifelike designs nearby. Incredibly, Mrs. Alexandrino does not use any aids to create these drawings, but the gallery provides magnifying glasses beside her works to encourage closer study. One of her works in particular reminded me of Islamic calligraphic art with its looping, intricate swirls and curls. Another highlight looks like a Calder mobile, all branching thin lines with rounded detailed forms dangling from the ends. Simone Alexandrino, "Untitled 8". Reproduced with permission. According to the owner of Hinge Mondern, when Ms. Alexandrino sets out to create one of her pieces, she goes into a bit of a trance. She starts with an outline of a form, and then gradually fills it in bit-by-bit, using only one color per sitting. Mr. Sahni, in response to his fiancée, morphs her delicate ink drawings into equally complex, if often more symmetrical, works all his own. 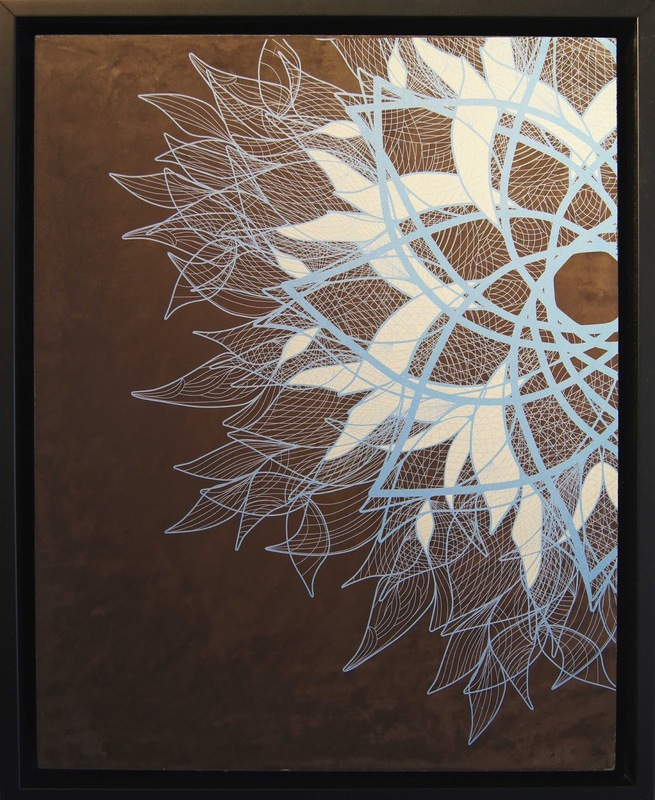 He uses a variety of media in meditations upon Ms. Alexandrino’s designs, from laser woodcuts and aluminum sheets as well as ornate wall sculpture. He turns her pensive, irregular forms into regulated, ornate images. One of his works brings to mind a glowing mandala or a rose window, with its lovely, luminous radial quality. 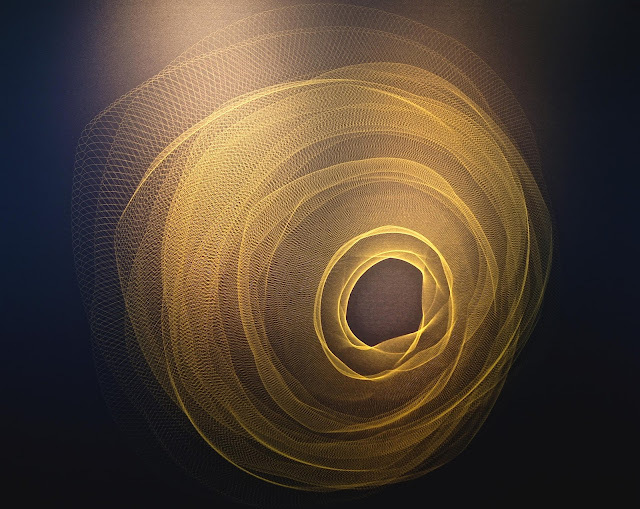 The immediate highlight of his contributions, however, is "Print 5", reproduced below, a digital image of a luminescent golden circular form made up of intricate spirals. Daksh Sahni, "Print 5". Reproduced with permission. While her work is clearly organic and handmade, his distances itself from the human element: it has not been touched by human hands, having been crafted on a computer and executed with advanced technologies. Together, the sets of works create an intriguing dialogue about how simple ideas can become so much more with a little creative playing. Daksh Sahni, "Tile 2". Reproduced with permission. The gallery itself is a nice little oasis from the busy street. Its interior is spare, and white, with painted cinder block walls and stucco ceiling providing a simple atmosphere to concentrate on the works on display. “Simone Alexandrino and Daksh Sahni: Out and In of Symmetry” runs until September 3rd. The exhibit provides a nice, peaceful getaway from the hectic sensory overload of the outside world. These artists prove to be champions in detailed, visually enthralling precision.